Last night the ministry of health has declared officially that 760 were injured and 2 were killed , one from Cairo and one in Alexandria. Now today the ministry of health has declared the injured have reached to 982. We got injured from Alexandria and Suez aside from the Tahrir square’s on going massacre.50 protesters have been detained as rioters. A group of protesters at Tahrir square has issued a statement saying that they will continue in the sit in till we have a regime from the people themselves. 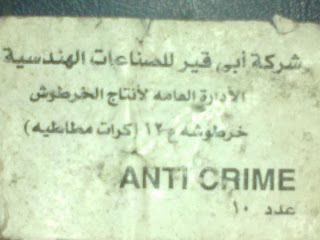 Again this is not an official statement from all the protesters at Tahrir square but rather a group of them. The clashes are still on at Mohamed Mahmoud street where it leads to the ministry of interior HQ. The CSF is still using tear gas grenades and rubber bullets. The protesters are reporting that the tear gas grenades or the new gas grenades got strange effects that made some suspect that it is some sort of nerves gas. It was proved that the tear gas grenades made in the USA was expired from 5 years ago. They also found this cover for gunshots package which they dedicate to the MOI that deny using the gun shots against protesters. 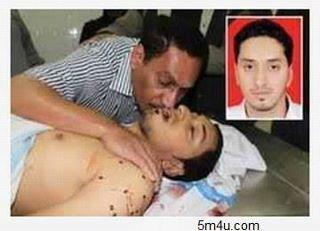 Here is Ahmed Mahmoud with his dad in the morgue !! Ahmed's dad kissing him in the morgue "twitter"
In Alex things may escalate as the young man who was shot down by the police force Bahaa El Sonussy turned to be from a big family that it will not leave his right. 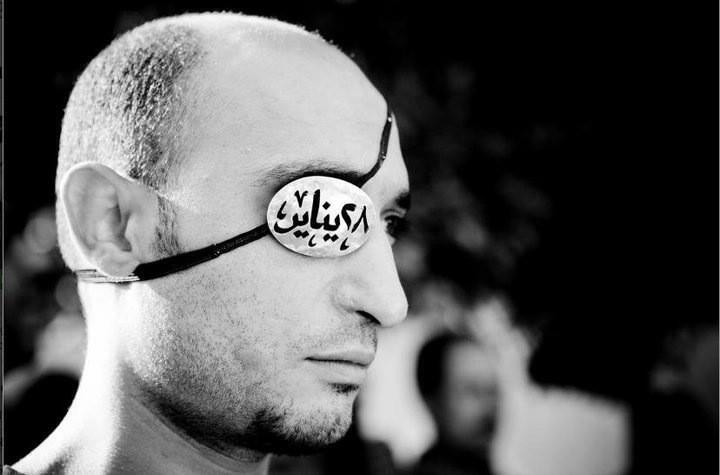 El Sonussy was shot down in front of the security directorate. Here is a photo showing him moments before he was killed , he was the young man on the right. Late Sonussy on the right "Facebook"
Here is a video showing him moments after he was shot allegedly by a sniper rifle.The video is unclear though. 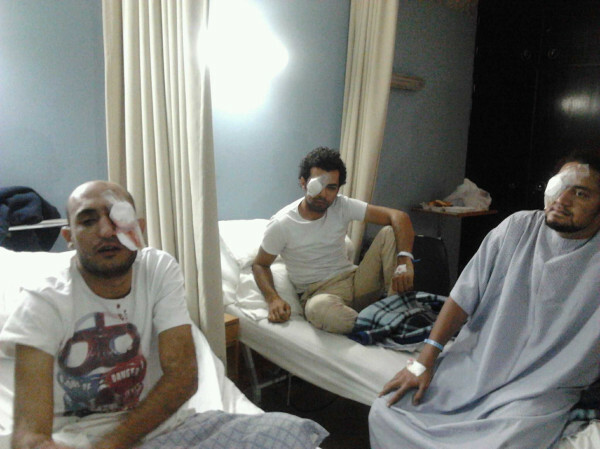 Bahaa was a member of the Revolution Youth coalition in Alexandria and Tayar Al Masry party.Here is his photo in the morgue "graphic"
It is not only Malek or Abdel Fatah who lost one of their eyes , but as well Dr. Ahmed Harara who is on the verge of losing his second eye. He lost the first on January 28th and now he is undergoing another eye surgery that may or may not save his other eye. Please pray for him . Harara is a dentist from Maadi by the way. Based on the tune in the radio or TV SCAF may sacrifice the Essam Sharaf’s cabinet especially with the increasing talk about the national unity government. Potential presidential candidate Mohamed ElBaradei held talks with SCAF members yesterday about national salvation government. There are news that Sheikh Hazem Abu Ismail , the potential presidential candidate will meet with SCAF members. Mohamed Salim El Awa went to Tahrir square trying to convince the protesters to leave and in the end he had to leave just like Mamdouh Hamza. Amr Moussa cut his regional tour and is heading back to Egypt. Last night the only SCAF member that spoke on TV was Major General El Fangary of SCAF. El Fangry spoke on air on Al Hayat and ONTV channels and of course he accused some unknown parties of using the injured of the revolution to the end of this talk. Of course I felt in his voice there was no defiance as much as confusion in my point of view. He says SCAF can hand over the power by the end of 2012 in the best situations according to their view. Speaking about TV , well the Egyptian national TV’s website “Egytv.net” has been hacked today. This is for the nonsense you broadcast last night on TV. The same failed media policies and hypocrisy. At first you were hypocrites to Mubarak and now to SCAF.All what we want is to transfer a clear image. People are dying and you transfer a romantic scene from the Nile !! Sacking off Essam Sharaf’s cabinet. Forming a national salvation cabinet and handing it the political powers of SCAF. Having the presidential elections in April 2012. Reforming the ministry of interior for real. The peaceful front for change also issued a statement about what happened with set of demands. Sacking off Essam Sharaf’s cabinet and appointing Hazem El Babelawy as a prime minister and famous law professor Nour El Din Farahat as ministrer of interior !! 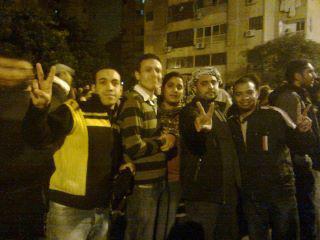 Ending the military trials and immediate release of the military trials’ detainees above them Alaa Abdel Fatah. A clear timetable for handing over power with presidential elections by the end of May 2012. The supreme council of judiciary investigates the clashes otherwise they will ask the UN to investigate it. I have doubts about the elections , in fact I feel that violent escalation from the MOI’s side is intended to delay the elections. I am worried , I will not deny that I am worried aside from all that romantic revolutionary talk , I am worried because I am afraid that we are pawns in some sort of game of interests and powers , I am worried that this kind of irrational thinking from SCAF may prepare us to another coup from inside the army where our odds in a country like Egypt to have another Nasser are high based on the fact that’s a pharaoh's nation. Realistically speaking SCAF has still got an opportunity through concessions yet what I see makes me feel that they do not think in the right way when it comes to politics or even to protect their interests. My only bet now is on God to keep this nation safe. Very good reporting as always! Yes, we must fear there is something going on in the back of some minds that is not meant good for Egypt. The demands must be met, or the nation has no chance. Of course the army is defending their interest. that should be no surprise to anybody. Likewise all those who benefitted the one way or the other from Mubarak is opposing the revolution. 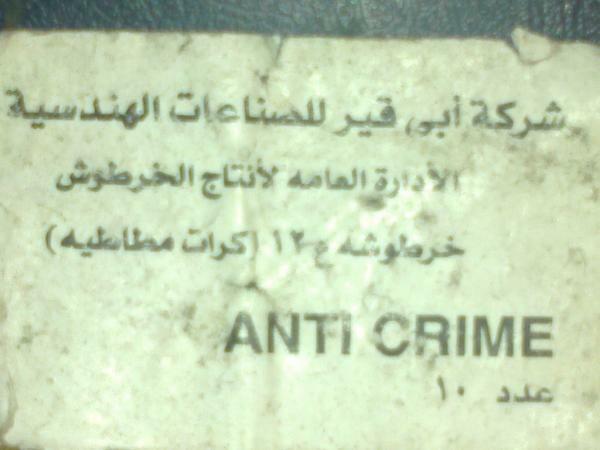 Sadly there are still Egyptians (thugs) that can be bought and who are fighting the revolution just for a few Pounds. Sadly there are religious groups who would sacrifice the values of the revolution for their very own greed for power. Why should Essam Sharaf besacked and be replaced by an old man as Beblawi? 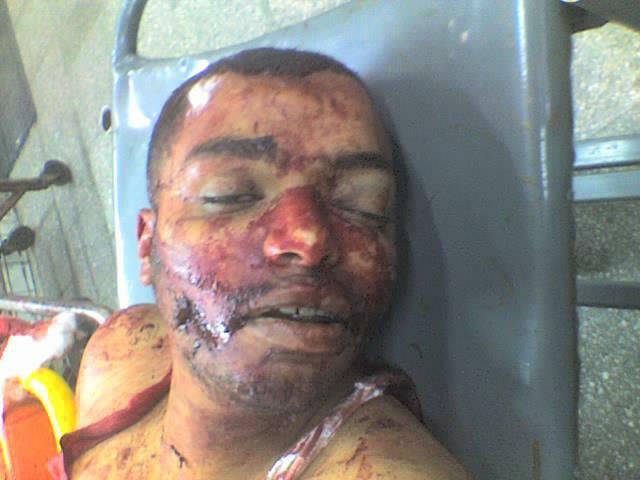 Essam Sharaf is a good man, but he cannot do anything as lonmg as Tantawi calls the shots. Changung the Cabinet to appease the people was Mubarak's style. I think we should support Essam Sharaf to fire Tantawi in order to save our nation. state, your next government will be moderate Islamic and democratic thus fit for purpose the question is whose purpose?.